For each type of object that needs global access, create an object that can provide the illusion of an in-memory collection of all objects of that type. Set up access through a well-known global interface. Provide methods to add and remove objects, which will encapsulate the actual insertion or removal of data in the data store. Provide methods that select objects based on some criteria and return fully instantiated objects or collections of objects whose attribute values meet the criteria, thereby encapsulating the actual storage and query technology. Provide repositories only for aggregate roots that actually need direct access. Keep the client focused on the model, delegating all object storage and access to the repositories. Suppose we are having a database with table Users in it. First of all we have to create a Data Model class. 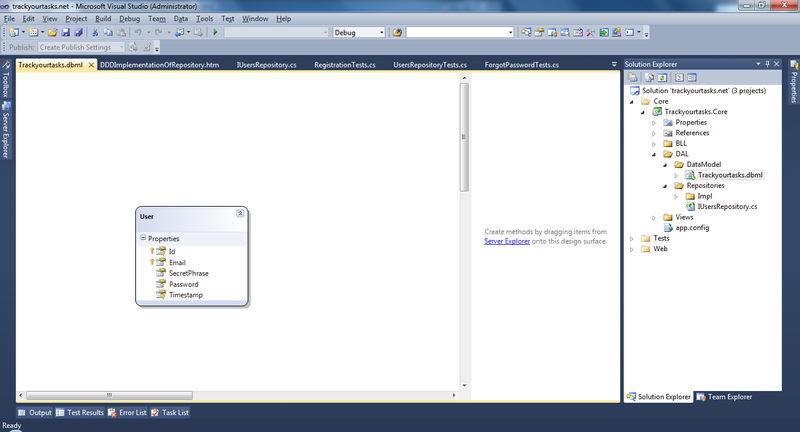 To do that you can add “New item” to you class library (or application) and select Linq to Classes. 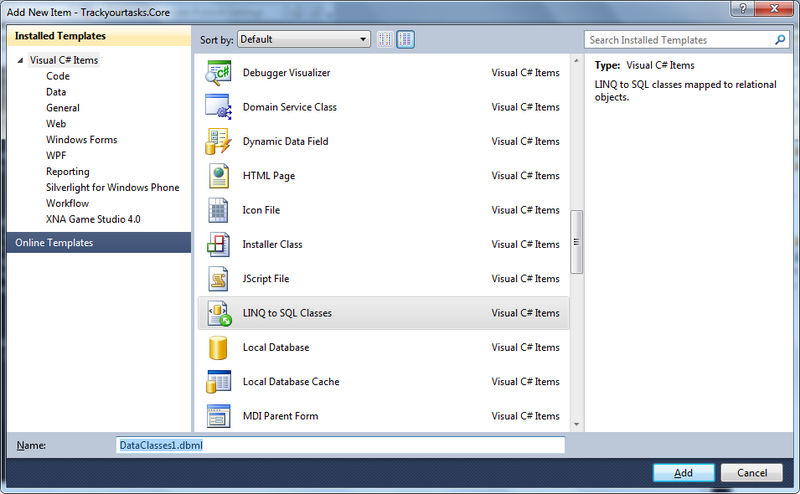 Now if you open corresponding .cs file of Data Model you can easily see what code is actually generated by Linq to SQL. Let’s quickly review it. So, most improtant class is DataContext. DataContext is something that suppose provide access to tables and objects and track the state of these objects. It uses SubmitChanges() method to flush the data to database. It is lightweight object and you should instantiate in in method of class scope, there are no reasons to keep a single copy of object for whole application. 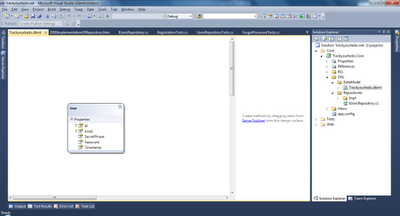 It is not only possible to work with tables within DataContext, but stored procedures as well. Besides of that the object represenation of table record is generated. The class is called User (please not that Linq to SQL is removing plural -s suffix by itself). So as you see it incapsulates fields of table as corresponding properties of object. As it said above Repository have to add, remove as well as search and update objects. Note, that we work work with db record (entities classes) as we just work with in-memory objects. It is always good idea to work with such structures as Repositories, Factories, Services etc. throught interface. First of all, because it conforms to common object oriented design guidlines and make us possibility to have different implementation classes that would provide different behavior. Second, that with interfaces you can substitute real object with mock object during testing. Moreover with interfaces it is easy to use Dependency Injection pattern, that improves application flexability and testability. 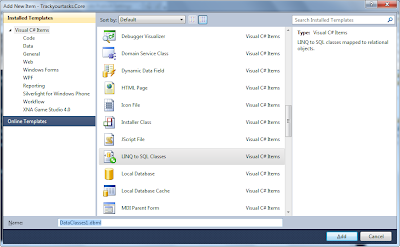 Now let’s implement this repository with Linq to SQL tools. We would review all methods, one by one. As you see I instantiate DataContext object as a member of UsersRepository class. So, it will be alive and tracking objects since UserRepository class is alive. Impelementation is just a simple Linq query that selects object either by Id or Email. I use SingleOrDefault() that returns object if found and default if not (null in my case). So object is marked as to be deleted by calling DeleteOnSubmit() and it will be actually deleted on SubmitChanges() call. It is really easy to start up with Repositories keeping its implementation as simple as possible. Of cause, typicaly data structure in databases are bit more complex than plain table. But it is still possible to work with this pattern, combining with Repositories, Aggregates, Entities and Values.